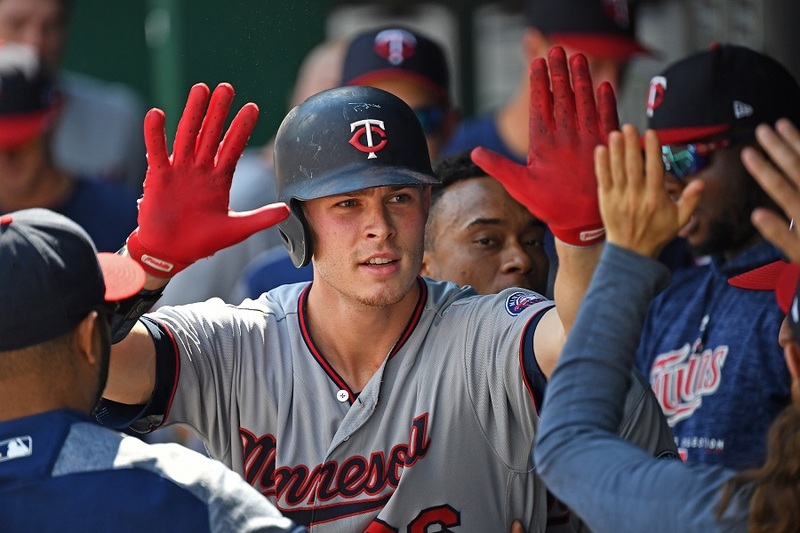 Hours after news broke that the Twins agreed to an extension with Jorge Polanco, the Twins are nearing a five year contract with Max Kepler that will guarantee him $35 million, according to Jeff Passan. There is also an option for a sixth year for another $11 million. Signed just nine days after Jorge Polanco in July of 2009, the German-born Max Kepler is finalizing the terms on a contract extension. Phil Miller has more specifics on the deal with includes bumping up his 2019 salary significantly. He gradually worked his way up the minor league system, spending a second year at Elizabethton. He was the Twins minor league player of the year when he was named MVP of the Southern League in 2015. After the Lookouts won that Southern League title, he was called up to the big leagues and singled off of Johnny Cueto (then of the Royals) for his first major-league hit. He came back up to the Twins in early 2016 and since mid-season that year, he has been a fixture in the Twins lineup. A terrific defensive right fielder, Kepler also showed that he can play a quality centerfield as well. Offensively, he hit a career-high 20 homers in 2018. While his batting average dropped to .224 in 2018, he showed improvement against left-handed pitching and walked much more. Kepler just recently turned 26 and has been able to remain healthy through his early career. Last month, he agreed to a $3.125 million contract in his first of four arbitration years. With this deal, the Twins have bought out his four arbitration seasons plus one year of free agency and allowed for a second year. A 10:00 Eastern time press conference is scheduled in Ft. Myers. Could more extensions be in the works? Good, really team-friendly extension. He’s got to get more consistent at the plate, but I’ll be happy to see him in the outfield for the next 5-6 years. For those underwhelmed by Kepler and wondering if this was an overpay, here is a great article from Fangraphs for some inside numbers perspective. Sounds like the Twins enticed Kepler to sign with a big up-front salary boost. IMO that's exactly the right approach -- take advantage of your present spending flexibility to front-load extensions and maintain cost control down the line. Those first few years of FA could turn out to be a crazy bargain. Congratulations to Max! Another good deal for everyone involved. I have no complaint on this extension, or the one to Polanco. I want to see more. Rosario and Berrios. I think the wait and see stance on Buxton and Sano is a mistake. Show the players you are willing to take a risk. If both received similiar deals to Kepler and Polanco it would hardly handcuff the team even if the players don't pan out. But if Sano and Buxton come through which we all hope then the extension prices will greatly increase. I don't see Kepler as being any less of a risk. Looking into stats and projections, I think Polanco's contract would have been pretty close to Kepler's had he not been suspended for half the season last year.Assuming he had the same rate stats for the full year he probably would have been worth about 2.5 WAR last year, about the same as Kepler, and they both project to be about 2.5-3 WAR players this year (according to Steamer).Kepler had a bit more consistency in his first couple of seasons, but overall they would have been in a very similar spot without the suspension. So the PED use and suspension might have cost Polanco a little less than $10 million in earnings. I'm generally not that into discussing the morality behind PED use, but it's interesting to see what the penalties of the league policy are now.I think for a more established player, the penalty wouldn't be much more than the lost earnings during the suspension, and it's hard to say how it might affect a younger player that gets busted before really getting established in the major leagues. Seems like a fair deal.Nice to have some cost control, and cost stability with the way they structured the contract.I am a little nervous about him being able to hit but right now there is less pressure on his hit tool because his defense is so good.If he can become a 270 hitter with 20 or more home runs per year this will be a good deal for the Twins. Nice thing about both extensions is if Kepler and Polanco improve we have them locked up through their prime years. His numbers are the epitome of consistent. He just needs a better success rate. A BABIP more consistent with his career norm would up his numbers substantially, presuming he can maintain his peripheral ratios. A BABIP of .300 (which is roughly league average) would make him an all star, even at right field. And a better OB%, which was what he was supposed to be bringing to the table from the minors. Lets hope the Front Office sees/knows something about the type of player Max is going to be in 2019 and beyond.Getting these two on long term contracts could fill their #2 and #3 spots in the batting order for the first half of the next decade.And doing so at a reasonable cost. Now lets get Berrios and Gibson into the mix and I will be more than excited.Also curious if they are talking to Eddie, who was out best player last year and is closer to free agency. Looks like this is the analytics approach to baseball contracts. Our 2009 international signings have to be one of the best grouos of all time. I don’t think it is a coincidence that the first two extensions went to the guys that have good BB and K rates. THEY EVEN FRONT-LOADED A BIT! My grumpiness over the offseason is decreasing exponentially. Keep it coming, boys. Don't stop at Polanco and Kepler. Now if the Twins extend Rosario, I expect they give first base gloves to both Larnach and Kirilloff starting this Spring Training. Love the deals. Berrios and Rosario next please. I like this, but I'll admit this one makes me a little twitchier. Twins are definitely betting on kepler taking a step forward on offense. I hope they've bet correctly. Of course, with Kepler's defense and at this price, a team would still take last year's offense and defense even at the new price of $6-7M/year in CF. Both of these contracts look great to me, barring a performance setback. Neither limits the trade value and liquidity of the player. If my math is right. The Twins just purchased one year of free agency and potentially a 2nd year. He should be 32 when he becomes a free agent. I believe it's a good gamble and I'm happy for Max. I'm just going to continue my perpetual hope that the Front Office recognizes the gamble for what it is and understands that the money being paid is the cost of doing business and is therefore fully prepared to not go down with the ship... if the ship goes down. If Kepler is hitting below average and still playing all 162 games just to try and justify the extension by forcing it... It will be a bad move. If Kepler is hitting below average but they allow someone else to surpass him for playing time despite the millions owed. I will be OK with the extension because... they took a shot. They rolled the dice and they can try again next year and the money does not bankrupt them. Extensions are fine... as long as the organization doesn't allow an extension to kill your team if it doesn't work out. With that said... Go Get EM MAX!! !